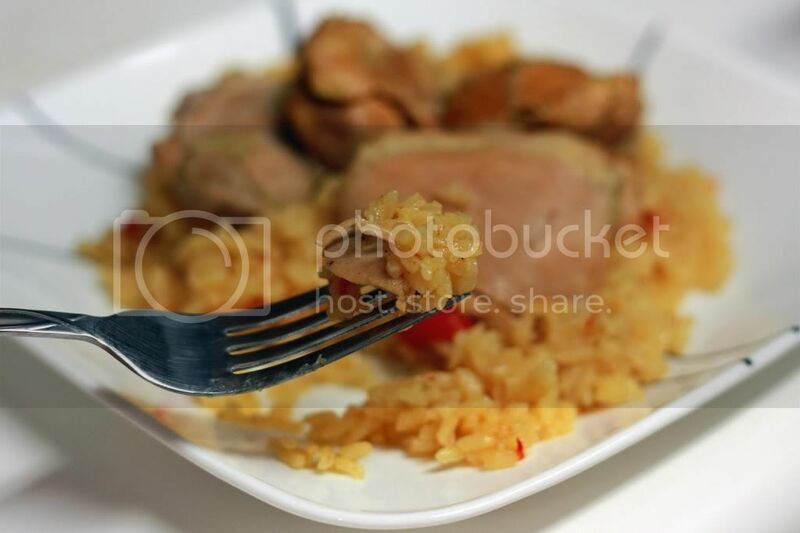 Runs With Spatulas: Arroz Con Pollo & 200 Posts! 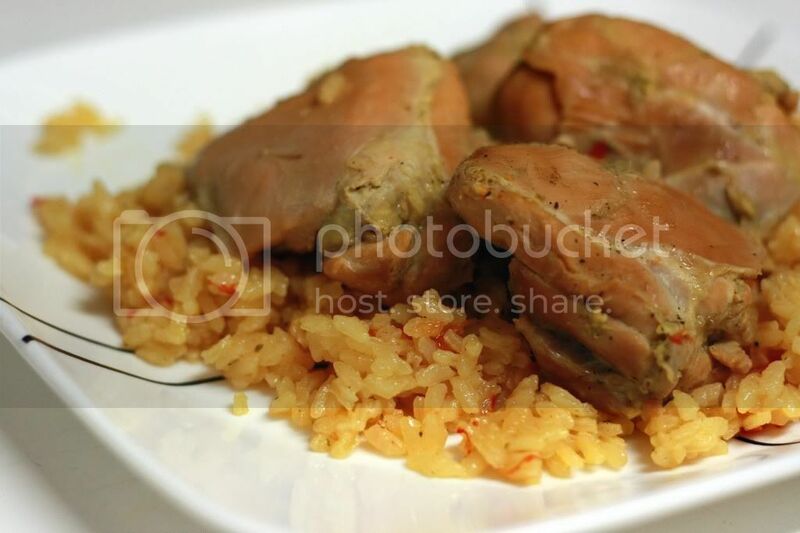 Arroz Con Pollo & 200 Posts! Woohoo! So I have officially made it to 200 posts. Who would have thought? 2 1/2 years and it's been quite a journey. Prior to starting this blog my cooking repertoire was slim to almost none and consisted primarily of baked goods. Well, and some blue box blues. I think about 190 recipes later I've made a bit of progress. Not only have I learned how to properly cook chicken in the oven and on the stove-top (rather than in the microwave) but I've also tested my comfort zone by making my own homemade pasta and even marshmallow fondant without a stand mixer (what was I thinking??). I've gone from having to follow every recipe to a "T" and measuring everything out precisely to being comfortable switching out ingredients and measuring things out by sight. I have to admit though, it also helps to have a very forgiving taste-tester, as I've definitely had my fair share of doozies. For my 200th post I figured I wouldn't just share any old recipe with you, but one of my very favorite meals. When I was living down in DC with my sister, our other roommate Laura taught us how to make a traditional Puerto Rican Arroz con Pollo. And it is SO.GOOD. I am totally craving this right now just looking at these pictures. It's really difficult to describe the flavor of this dish, with it's mixture of traditional Puerto Rican flavors of sofrito, adobo, and pimientos except for the word delicious. Season thighs on both sides with adobo; place into a dutch oven. Add pimientos (with liquid), sofrito, and cubitos. Add just enough water to cover chicken. Place over high heat and let boil, uncovered, for approximately 45 minutes or until thighs are tender and cooked through. Add water if necessary to keep thighs submerged. Remove thighs from liquid and set aside (DO NOT DRAIN). Add 1 cooking spoonful of vegetable oil and the rice to the liquid. Stir. Cook over medium-high heat until water is absorbed. DO NOT stir. Once water is absorbed, stir rice gently. Turn heat to low and cover. Cook in 10 minute increments until rice is correct texture; stir every 10 min. *A "cooking spoon" refers to the large nylon spoons used for cooking (not from your typical silverware set). So there are LOT of side notes about this recipe. If you can't tell by the measurements and directions, it's definitely one of those recipes that have been passed down (which just supports how good this is). First, you can use chicken breast for this recipe, and as much as I am not a fan of dark meat... it really makes this dish. White meat just gets too dried out. Second, I cheat with the sofrito. Laura is an absolute gem and brings Jen and myself back huge containers of sofrito that one of her neighbors makes. However, if you are looking for it in the store it is the GREEN sofrito NOT the red. (The green sofrito does not use tomatoes.) Or you could make it at home using a recipe such as this: Green Sofrito. As for the cubitos de pollo con achiote, the achiote part is very important. And very impossible to find out here in Pittsburgh. Unable to hold out for the actual thing, I combined 2 packets of Goya Chicken Bullion with 2 packets of Sazon Goya - Con Culantro y Achiote and it was almost spot on. So if you can't find the cubitos de pollo con achiote, this would also work. Finally, if you're like me and feel that rice has a mind of it's own, stick with medium grain rice. It's a little harder to find (I had to go to a specialty store for it), but it will ensure the proper cooking time and you won't have to fight with crunchy or mushy rice. As for the whole not stirring part, yes there will be burnt crispy rice at the bottom. Don't worry, it's supposed to be that way (it's actually Laura's favorite part). I know, I know, sounds a little complicated. But I swear, once you have it, you will crave it like none other. Congrats on post 200! I'm only up to 16 since last fall. We've made it a few times and it is delicious. We've been to Puerto Rico and the Arroz con Pollo there is very similar, if not identical to the Cuban version. 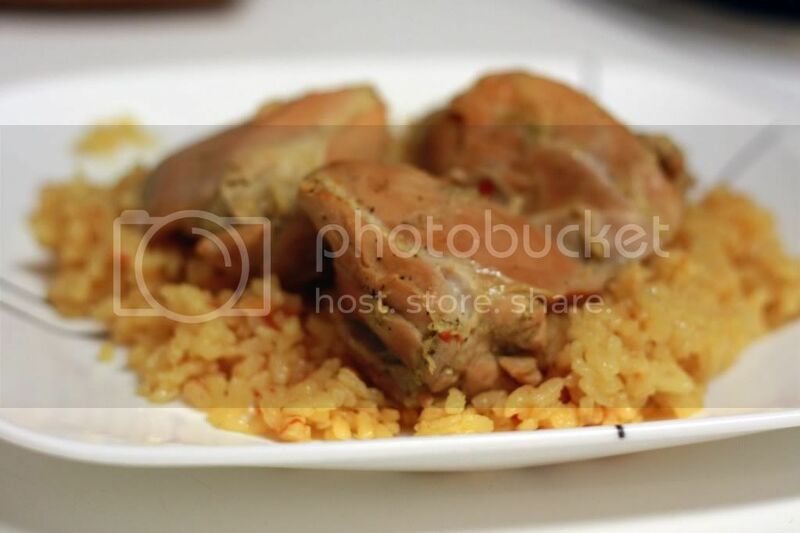 Try this Old Havana Foods sofrito and you'll be able to enjoy Arroz con Pollo whenever you have the craving. My computer was running just fine until I visited a normal, news website, one that I visited a 1000 times, and my computer became infected with one of those Fake "Anti-Spyware" viruses. I used both Super Anti-spyware and Malwarebyte's malware programs to finally get rid of that virus, and I rebooted my computer. The virus is gone, my computer is running fine again, except I can't use the Internet Explorer or Safari web browsers (I'm using Netscape now). Whenever I open a window in IE or Safari, I get an error message, "Cannot display web page." This happened once before, and I used the System Restore function to take my computer back to a time before a virus hit. But now, System Restore won't start, nor can I get my computer to work in Safe Mode. How do I get System Restore to start up again? I tried several different ways, but nothing is working. Help! (I have an HP Pavilion Desktop PC with Windows XP Media Edition). Thanx in advance!